A Matter of Days by Amber Kizer. Review: Did anyone survive the Bluestar? Can we get to Uncle Bean's place? Will we survive? young Nadia asks herself as she sets on a journey half way across America in A Matter of Days by Amber Kizer. A Matter of Days is about a journey of clouded Nadia, her younger brave brother, lovable Twawki a dog they discovered, and a street-smart boy named Zack. Nadia's mom has died of a horrific military-made disease called the Bluestar. It has already killed 98% of the world's population but Nadia and her younger brother are snuck shots from their Uncle Bean the man who created the disease. Perplexed by the unpredictable journey they come across many endangerments and menacing people and know only to be a cockroach, which taught to them by their father in the means to survive like one or, by be one in a harsh environment. Will they make it to their Uncle's house in time to save their lives? You'll just have to find out yourself. A Matter of Days is must-read, and intended for late elementary and middle school students. Trust me there is nothing unappealing about A Matter of Days. One ingredient of a book recipe includes plot and this book has a plot that is mystifying, suspenseful, and engaging. For example in one part, all of a sudden cougars appeared as the characters were sleeping and then Nadia wakes surprised and says "We have no chance to attack without moving towards the gun." And has no idea what to do but then hears barking. Also the book exemplifies descriptive language, for example in the beginning Nadia thinks this sadly as she leaves her home and sees her mom lie dead "Quiet. Peace. Finally. Exhaustion frayed my edges, fringed my cogent mind until world-hazed gray blue." Finally it includes suspense that makes you sit on the edge of your seat and eating your nails wondering what is going to happen. For instance when a stampede comes they turn off the car and then hear gunshots The reader experiences what Zack, Nadia, and Rab see and hear as they panicked in fear. 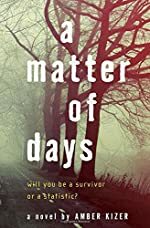 In conclusion check out the outstanding A Matter of Days by Amber Kizer. We would like to thank Random House for providing a copy of A Matter of Days for this review. Have you read A Matter of Days? How would you rate it?